In 1968, the late Bud Alderson of Sharpsville, had the foresight of having IQHA present a Quarter Horse to a deserving 4-H member from Indiana. With the assistance of the Board of Directors and Purdue University’s 4-H Office, Bud created an application and proceeded to get 4-Hers from throughout the state to apply. 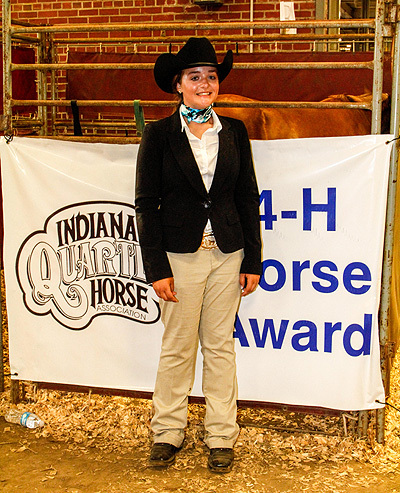 The concept behind the award was to provide recognition to ten deserving 4-H horse/pony members; provide one 4-H’er each year the opportunity to own and train a registered Quarter Horse; and to generate additional exposure for the Indiana Quarter Horse Association. Those first finalists showed up at the 1968 Indiana State Fair and proceeded through an interview process before the initial winner, Dana Magnuson of Fort Wayne was selected. The first yearling, Pasiano Bert, was purchased by the association at the State Quarter Horse Sale held at the Marion County Fairgrounds just four days prior to being awarded to Dana. The award has generated longstanding relationships with IQHA with past winners. The 1973 winner, Beth Lancaster Moon, has gone on to national prominence showing Quarter Horses and Top Ten placings at the AQHA World Show as well as serving as an IQHA director. 1992 winner Ginny Tauer has won an IQHA All Around title and currently serves as 4-H Horse Award Chair and IQHA secretary. 2003 Winner Sarah Van Hoy went on to serve as the Indiana Quarter Horse Queen. 2007 winner Dana Hicks Competed at the All American Quarter Horse Congress with her filly One Hot Coastal. Thank you to the 2016 Sponsors!